This is a continuation of the saga on my way to earning the coveted Southwest Airlines companion pass. You can read Part I here. This is where I ran into a little trouble, and hopefully you can learn from my mistakes. You see, credit card companies don’t want to just give you as many cards as you ask for, whenever you ask for them. They want to ensure they’re creating long-time customers who will use their card, thus generating revenue for them and their shareholders. I initially applied for the Plus card the same day as the Premier card, as this would limit the hard credit pull to one, instead of two, on the ol’ credit report. I did not receive immediate approval of the second card and was told my application must be reviewed. A short while later, I received the dreaded letter in the mail: DECLINED! First, let me tell you that this is a bit of hit to the ego; no one wants to be declined for a credit card! Second, let me tell you that if this happens to you, now is not the time to give up on your pursuit of the companion pass. 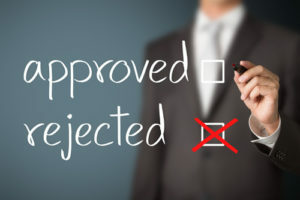 I learned a lot about what to do and what not to do when trying to convince the bank to reverse their decision. I did know that Chase will automatically reject you if you if you’ve received five cards in the last 24 months, and I was in the clear on that one. A little less known policy is that they will not allow more than two cards in 30 days. Since I had just received the Chase Sapphire Reserve card a few weeks prior (click here to apply for a 50k point bonus! Note:I’ll receive a bonus as well. Win-win), the SW Plus card made three for me within 30 days, and hence and automatic rejection. Since I did not know of this policy, I hastily called the reconsideration line (888-270-2127) and spoke to a representative. This is your chance to convince a real human that you will be a good customer and hopefully reverse their decision. If one of either the 5/24 months or 2/30 days rules applies to you, YOU WILL NOT BE ABLE TO REVERSE THEIR DECISION. There’s nothing they can do for you. At this point you can make clear that it’s not additional credit you’re seeking, and you’d be willing to reduce the credit line of the first card if that would help. Many folks have legitimate reasons for wanting to separate expenses between multiple accounts. Remember: Companies are looking to build long-term relationships, and they use sign up bonuses to bring those customers in. At no time should you mention that you’re only signing up in order to receive the bonus. My conversation with the reconsideration line was a complete disaster, but I later learned it didn’t matter. Should yours also not go as planned, this is still no time to give up! I have heard stories of some people calling back in a few days to speak to someone else. You might have better luck with a different person. I waited a couple of months until February and reapplied. The result: success! I promptly spent the $2k (it helped we were in the middle of a bathroom remodel and were able to charge some floor tile to hit this in one fell swoop), paid the $69 annual fee, and presto, 52,800 more points! At this point I had accumulated about 104,600 points in the calendar year, needing about 5,400 more to hit the companion pass. Again, I was lucky this was timed with a bathroom remodel, so we had no problems getting to this amount. Remember, the quicker you achieve the companion pass, the longer you can use it! 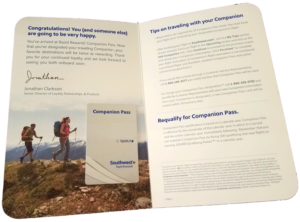 If you’re financially able, you can always purchase a Southwest gift card for however much you can muster, thus receiving 2x points, essentially having money in the bank to use on your Southwest travel later down the road. Also remember, be smart about your credit. If you’re charging things you can’t pay off right away, you might incur so much in interest charges that this whole exercise is futile. Great day when this little beauty came in the mail! Good info, man! I got approved for the Southwest Plus card and hit my minimum spend two weeks ago. Waiting on my 40k bonus points! Since I had just received the Chase Sapphire Reserve card a few weeks prior (click here to apply for a 50k point bonus!